Originally released on vinyl, in 1977, That’s not Funny, That’s Sick! 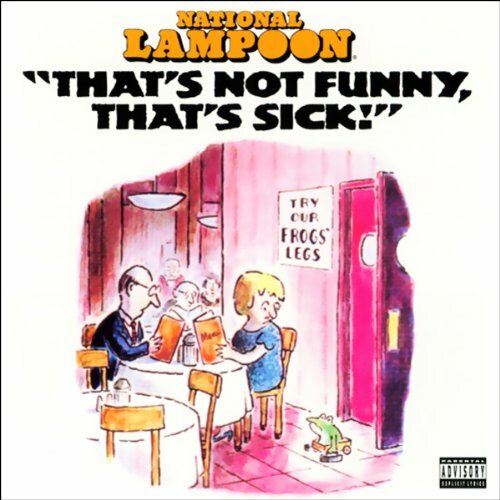 by National Lampoon is comprised of selections of comedy sketches from National Lampoon Radio Hour (1973-1974) and features the vocal stylings of such hilarious people as Christopher Guest, Bill Murray, Billy Crystal, and many others. Hearing this now-classic smorgasbord of great comedy moments should not be missed. From parodies of talk-radio, radio news coverage, and audio documentary to rousing novelty songs, this recording album bears witness to the emergence of these comedic giants who have had a major influence on American comedy up to the present day. Originally recorded in 1977 (but never released commercially), That's Not Funny, That's Sick! is as fresh today as it was when it was first performed. The writers and performers include comic legends Bill Murray, Billy Crystal, Christopher Guest, Richard Belzer, Paul Schaffer, Brian Doyle-Murray, Harold Ramos, and Larraine Newman. I've been searching for this title for years. Brings back fond memories and laughter of the 80's. Produced, mixed and engineered well with many well known commedians. A little nasty in spots, but still a classic. I bought the book after listening to the sample of which I thought was a little crude, but funny - big mistake! The funniest part about this book of only 35 minutes, is the sample. The rest is an imitation of humour camouflaged by profanity. Save your money - do not buy this book. If you're looking for something with real humor, you can do worse by buying some Dennis Millar or others.